I know some people think it’s sacrilege to paint over wood trim, but I feel fully justified in this case. 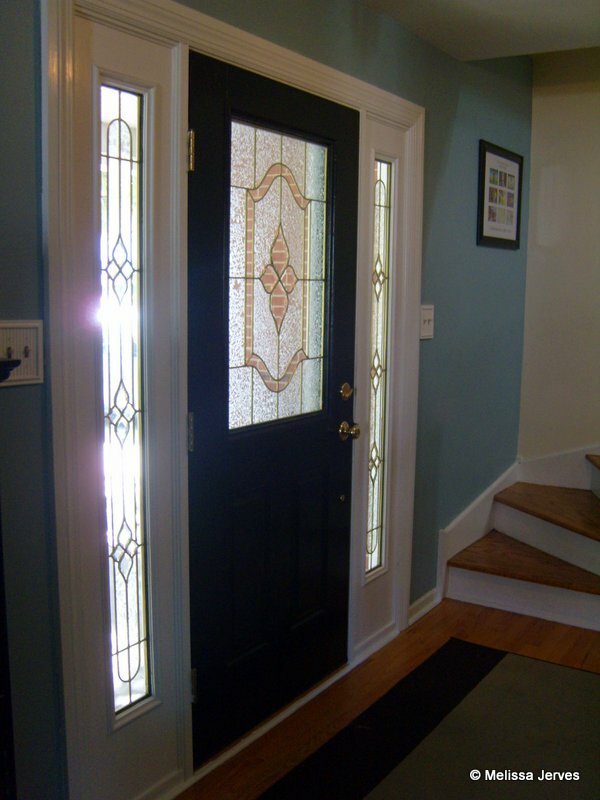 Here’s the deal: Most of the doors and trim in our house were painted white by previous owners. Our kitchen cabinets and crown molding are white. But in a few spots–most notably the foyer, hallway and family room–there was newer yellow oak trim and hollow-core slab doors. This isn’t lovely original millwork that ought to be preserved. I assume these were added when the hardwood floor was replaced at some point, because they don’t match the original baseboards and trim upstairs. Unfortunately, these spaces flow right in to the living room and kitchen, where the trim is white. So we’ve lived with all this strange conflicting trim–some of it even on the same wall!–for five years. It hurt my eyes. Oak trim around the white sidelights and black front door. Too many finishes! 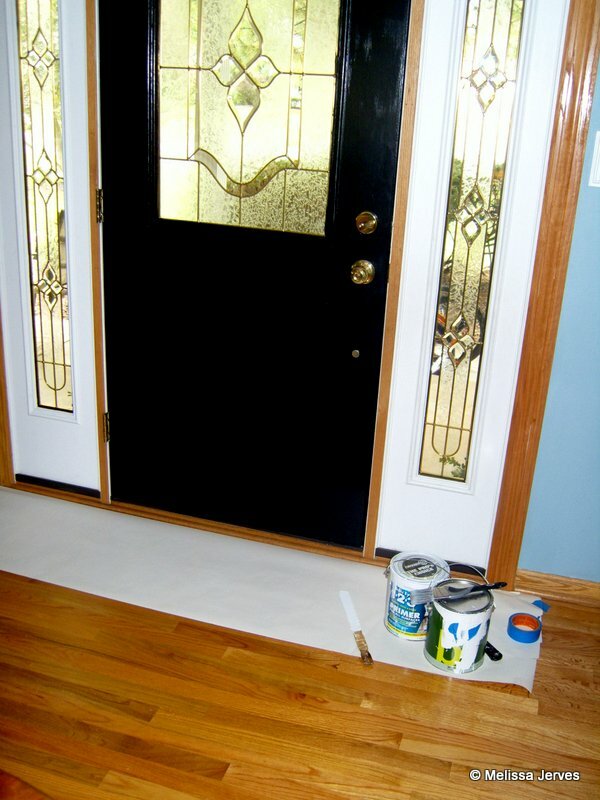 A few weeks ago, I finally got out the paintbrush and began on the trim in the foyer. Today I’m priming (maybe I’ll get to a coat of paint) the trim and three doors (pantry, bathroom and basement) in the hallway. For the foreseeable future, we’re leaving the family room alone. The room is more self-contained, so the conflicting finishes don’t stand out so much. Finished front door and baseboards. This is still a work in progress. I’m reasonably confident I’ll finish the painting this week, but I still need to remove the closet doors so I can paint the inside of the door frame. 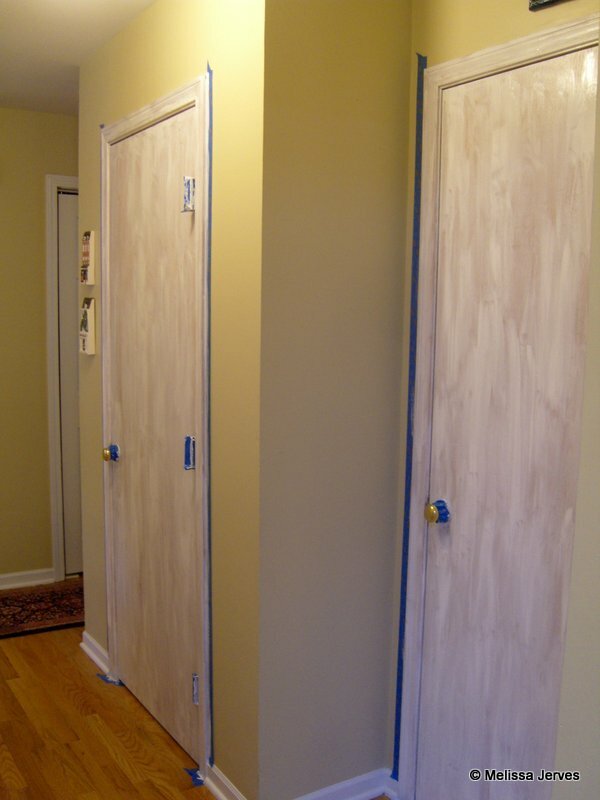 I would also like to add trim to the slab doors, like this project I found on Pinterest. Like most of you, I don’t have great swaths of time to work on these projects. Just 30 minutes here and there, between writing projects, laundry, supervising homework, chauffeur duty, and today, a sick child home from school. Too often I put things off because I don’t think I’ll have enough time to complete them. But usually, if I just start something, it doesn’t take very many of those small pockets of time to complete it. And the results are worth it. One door primed, one to go. If you’re tackling a project like this yourself, you might want to know what products I’m using. Even though the oak has a glossy coat of polyurethane on it, I’m not doing any sanding. I wiped everything down with a liquid deglosser, then used one coat of primer. Two coats of good quality interior semi-gloss (we’re using Benjamin Moore’s base white color), and it’s done. I’ve painted some trim without using the deglosser first, and it required at least two extra coats of paint, so I’d definitely recommend it. Already, the streaky coat of primer on those doors has brightened up the dark hall. I’m off to prime one more, and tomorrow I’ll do a little more. That paint makes so much of a difference! It looks wonderful! Painting trim is such a tedious job, it can get put off forever, but isn’t it great to see it finished? Nice work!! I finished two coats of paint, but now I’ve got to carefully peel the tape and do all the touch ups! 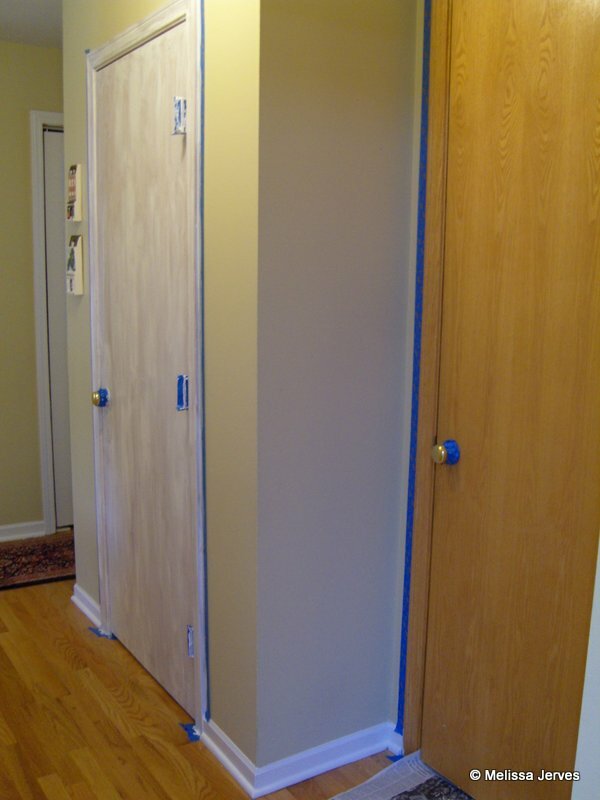 Not to mention the edges of the doors, which I decided to save for another day…But now it’s so bright in the hallway you can see that I ran out of paint for the walls and barely managed one coat. Add that to the list!